Congratulations to KTR Group, CarePlus™ Gold Partner based in Melbourne, Victoria, for successfully securing the new project to integrate a complete CarePlus™ Nurse Call System, including the new Antimicrobial Call Points, at Rose Lodge Aged Care. The $6 million redevelopment project at Wonthaggi will add 32 new rooms and new communal amenities as part of the major extension to the existing facility. CarePlus™ antimicrobial patient and staff stations / call points contain antimicrobial protection or infection control built into the device to reduce risk and spread of serious infection, bacteria, and superbugs such as MRSA. These call points ensure the safety of residents and staff as the antimicrobial material is able to achieve a 99% biocidal kill rate for a wide range of bacteria, and harmful microorganisms. 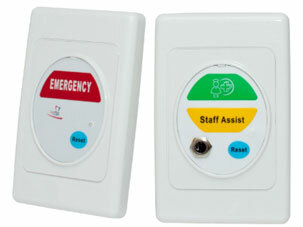 The CarePlus™ antimicrobial call point meets Therapeutic Goods Administration (TGA) requirements for medical devices, which requires medical device manufacturers to design and produce their product in a way that minimises or eliminates the risk of infection and contamination to a patient or user of the device. KTR Group is a long term Gold Partner of NiQ Health and two-time recipient of CarePlus™ Partner of the Year in 2009 and 2012. KTR has over 45 years’ experience in providing specialized services to the Electronics Industry, with a strong focus in Security and Healthcare. Since 1968, KTR is committed to deliver quality products and services to the industry, and recognized as a successful and respected provider in Victoria. Rose Lodge aged care, operated by Wonthaggi & District Elderly Citizens’ Homes Inc., is a not-for-profit organization based in Wonthaggi, Victoria. Since 1961, Rose Lodge has provided outstanding individual care for the residents in the region. This extension project will significantly increase the accommodation for the residents by 40%, and enables Rose Lodge to provide high-care and dementia care for the community.